The Real Challenges and Effects on Children and Parents. I wrote this book not to give a negative or bleak outlook on how our culture has evolved with the digital age but to show that the vast and rapid expansion of technology can be and is a double-edged sword. This is to share my perception as to what many are experiencing and what my experiences not only as an adult but as a parent with small glimpses looking back at my own childhood! 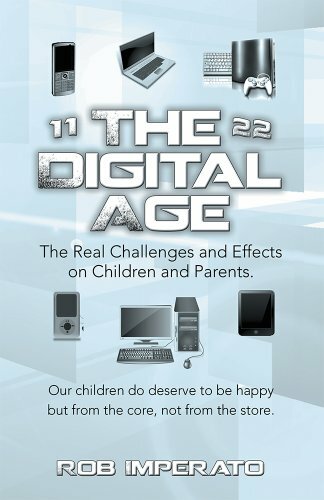 Most importantly, I share the experiences of the many wonderful parents that have shared with me their concerns and challenges in this highly and ever-evolving technological age, which I feel has become much more of a challenge than when my children were growing up. When it comes to parenting, there is no right or wrong about how we feel. These are our feelings, emotions, and values. No one has the right to tell us how or what we should or should not feel. And I am surely not positioning myself to tell anyone how to raise their children or what they are doing is right or wrong, but possibly to offer insight, to see things from another perspective.